Like you, I have had family members and friends affected by and currently fighting cancer. 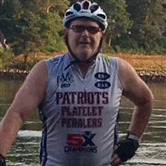 To help in some way, I will be riding 196 miles on August 3rd and 4th in my fourth Pan-Mass Challenge to raise money to find a cure. I am a proud supporter of the PMC, because it is leading the charge to beat cancer. In fact, last year 100% of rider-raised revenue went directly to support the Jimmy Fund and Dana-Farber Cancer Institute's tireless commitment to finding a cure. Thanks to many of you, the PMC raised more than $52 million in 2018 and is the largest athletic fundraising event in the world. I am asking for your support in my cause again this year.